Frigo underwear is RevolutionWear and is constructed with high-end microfiber fabric making it more breathable for men who choose to wear it. We’re going there folks. We’re going to talk about why men need better underwear. If your boyfriend or husband has complained about sweat and chafing happening in the nether regions, Frigo RevolutionWear claims to be the answer to his problems. Frigo RevolutionWear is poised to do to the men’s underwear market what Spanx did to shapewear. The New York Times describes it as Victor’s Secret. The Wall Street Journal says it’s ideal for underwear nerds. At $100, Frigo is the Hermes of the men’s underwear world. Oh and, in case you’re wondering, it’s not underwear. It’s actually RevolutionWear. 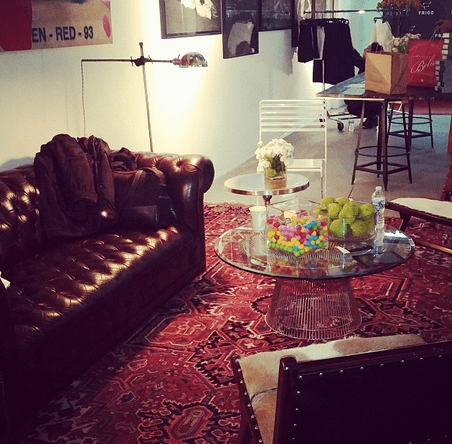 Yesterday, I stopped by the Frigo Pop-Up in the Meatpacking District and entered the man cave that all men dream about. An intimate lounge setting opened into an area with comfy couches and a complimentary espresso bar. For your reading pleasure, there were books by Rizzoli New York and vinyl records by NYC record store Other Music. I was able to listen to Jay Z’s music on an old-fashioned turntable. Simply put – it was epic. The record collection that was on display was every music lover’s paradise. 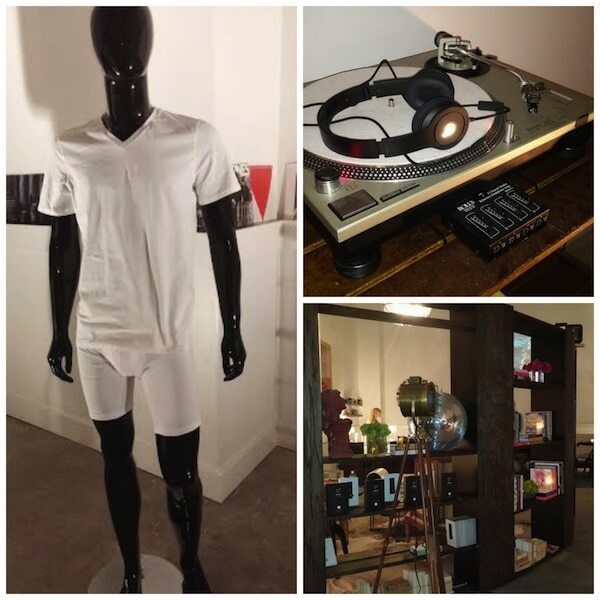 Complete with an interactive photo-booth and games galore, the Frigo Underwear Pop-Up Shop was the place to be. The man cave atmosphere was so chill and cool. I just wanted to bring out my laptop and set up office. I loved all the expressive modern art and the light show that was projected on the wall. I hung out for a bit with the founder and CEO of the brand, Mathias Ingvarsson. Mathias gave me a mini-education on all things Frigo RevolutionWear. By the end of our chat, I wanted them to start making women’s underwear. Here’s why RevolutionWear may change the market forever. Mathias is one of the founders of the Tempur-Pedic mattress so he knows a thing or two about game changing. When he first saw what is now known as the Frigo Zone, he was doubtful that anything this ground-breaking could be done to men’s underwear. Once he tried it on, though, he was sold. Why is it so special? Frigo RevolutionWear starts with high-end microfiber fabric. Through laser cutting techniques, the garment is made in Portugal with minimal sewing to ensure the most breathable, strong design. The high-tech design includes “mesh zones” that provide extra breathability. There’s even one in the back so that area remains cool and sweat-free. The inside of the hem is made from a material that allows it to cling to the skin, preventing it from riding up the legs and looking bulky which makes this style perfect for wearing with suits. The coolest (pun intended) part is the Frigo Zone, the mesh pouch found in all Frigo Underwear that holds and supports your man’s package while gently drawing it away from the legs. The mesh pouch is on the inside of the underwear so it looks deceitfully simple. There are then 2 outer straps that you can adjust for comfort to keep the …guys in place. These only need to be adjusted once the first time. The Frigo Zone is meant to keep that area cool and dry. This patented technology is what sets it apart from the rest. If your into exercising or are in the middle of a long summer day, this keeps the perspiration and chafing away. The $100 might not be for everyone but don’t worry!! Mathias has created a $30 version in cotton for Macy’s. Frigo RevolutionWear can be found at Macy’s and Neiman Marcus, among other retailers. Celeb fans of Frigo will be stopping by over the course of the next week to lend their support. GQ’s “Style Guy” Glenn O’Brien will host an exclusive book-signing for his new book “The Cool School” on Saturday from 5-6om. The FRIGO Underwear pop-up Shop will be open from 10am-8pm on November 20th, 23rd, 25th and 26th, and from 10am-pm on November 21st , 22nd, and 24th. Additional information can be found on www.frigoexperience.com. Go check out the underwear yourself and tell us what you think!